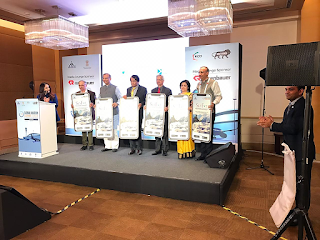 MUMBAI, 16 January 2019: Shri Suresh Prabhu, Honourable Minister of Civil Aviation Government of India, launched the official mobile application “Skyfit” for the Aviation fraternity on 16th January 2019 during the Global Aviation Summit at the Grand Hyatt in Mumbai. The application was launched in the presence of Hon’ble Shri Jayant Sinha, Minister of State, Shri. R N Choubey, Secretary, Civil Aviation, Dr.Shefali Juneja, Joint Secretary, Civil Aviation, Shri Anil Gupta, ED(LM&BD), AAI and Dr. Ashok Bhatt, CEO & Founder, AGP Breathworks. The “Skyfit” mobile application is available on google play store and iOS. The application is devised to address the occupational stress of the personnel in aviation, be it air traffic controllers, pilots, cabin crews, Ground Handlers, Air Passengers etc. The unprecedented growth in aviation has posed severe threat to the safety of aviation, in terms of the pressure created by capacity vs demand, on the existing infrastructure and resources. The worst hit of all is the human resource. The occupational stress due to cognitive work load of the personnel, especially in aviation can be a challenge for the safe aviation. Long term exposure to the stress is posing severe health issues like hypertension, ischaemic heart disease, diabetes, peptic ulcers and psychoneurotic disorders for the people employed in aviation. Various measures have been discussed in past like improving job planning and reliability of the work systems, improving the work environment, reduction of working hours etc. Airports Authority of India (AAI) has developed simple breathing exercises, in consultation with Dr Ashok Bhatt Medical consultant from AGP Breathworks and coordination with experts who have practiced these ancient techniques from yogic traditions, for decades and have found encouraging results in managing the stress of the aviation personnel, by just improving the way we breathe. AAI would like to share these unique and effective techniques, through its programme SKYFIT, with the aviation world, to cope up with the challenges of managing stress of pilots, cabin crew, air traffic controllers and above all air passengers. Speaking on the occasion, Shri.Suresh Prabhu, applauded the visionary initiative of Skyfit by AAI Stated that when India is poised to cater to the next 6 billion people and become a global leader, it also has to be equipped to address the stress level of the Human force and their quality of life. The solution lies in Skyfit. Speaking on the occasion Shri.R N Choubey, Secretary Government of India, appreciated AAI for devising such initiatives blending modern science with ancient yogic science for the benefit of all.